Am I the only one who adds this skill to her plans ASAP for the new school year? As. Soon. As. Possible. It's crucial, and it's one of those skills that kids tend to resist a little bit because they don't understand WHY it's so important. 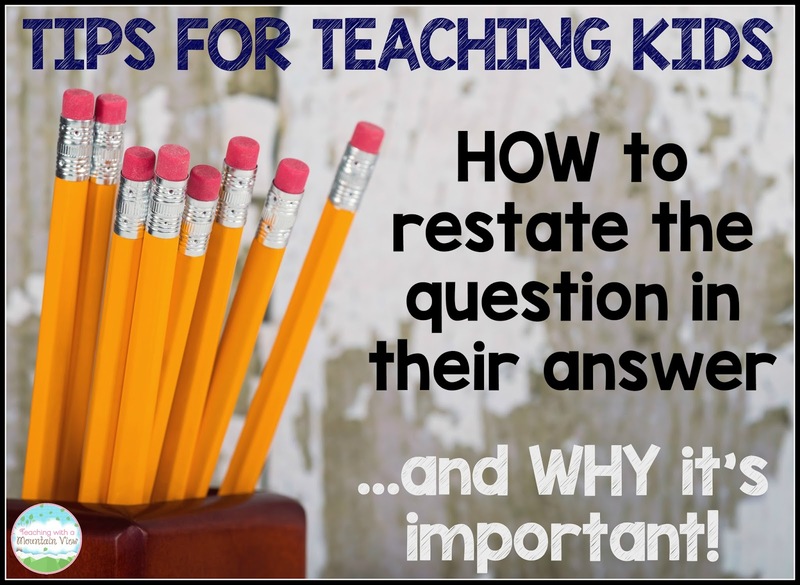 We start with a lesson about how to restate the question. PQA! Put the Question in the Answer. 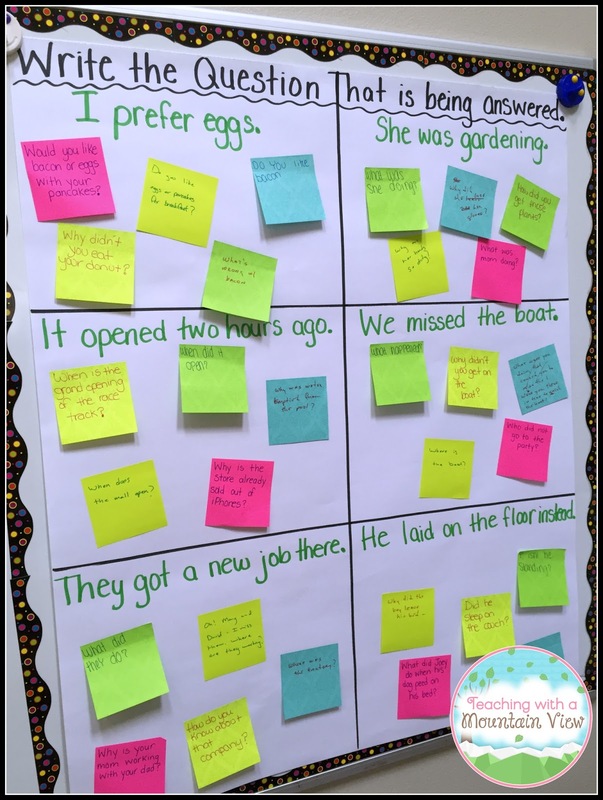 This can still be tricky for some kids, so we make an anchor chart together that shows them exactly how to do it. First, I explain that they need to identify WHAT it is asking them to find out, and most often, the easiest way to do that is by looking for one of the 5Ws-- Who, What, Where, When, Why, and of course, How. They underline what the question is asking in RED because they don't need to include those words in their answer. This prevents students from answering questions awkwardly. For instance, without taking this step, they might say, "How long it takes to get to the mall is 20 minutes." When they eliminate that question word, it sounds more natural. Then, they underline the keywords that they are going to use in their answer in green. You can see all of this in answer chart above. 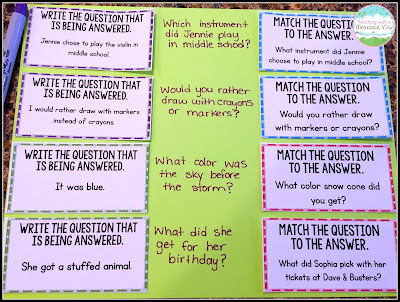 When we first start this skill, I have them use red and green to write their answers. The green part matches the words that they underlined in the question. The red part is their answer to whatever question is being asked. So, for the first question, they underlined "How long," and they write "20 minutes" in red to show their answer. This really helped my students to see how to format their questions. Eventually, it becomes natural, but at first, this is a great way to scaffold the skill! 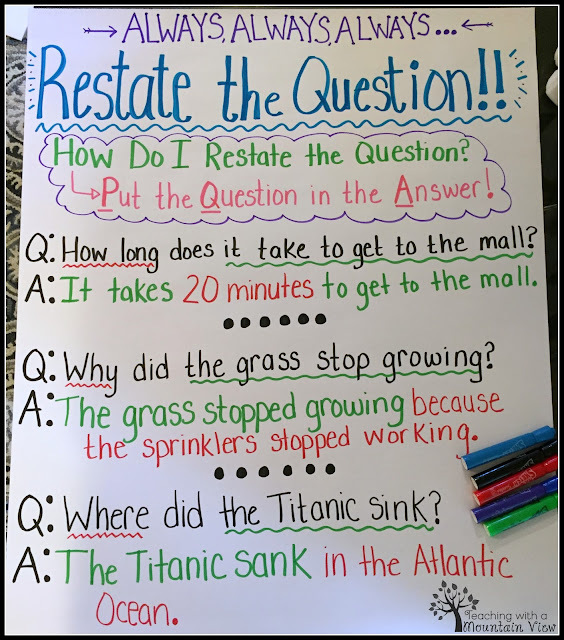 Next, we do some group work to show WHY it's so important to restate the question and to also see some of the incorrect ways that students sometimes write their answers. I wrote six different answers to questions on a piece of chart paper. Each group of students came up with the QUESTION that was being answered. For this first one, the answers were ALL OVER THE BOARD! The answers had almost none of the question in them, so it was nearly impossible for the students to figure out what question it was answering. 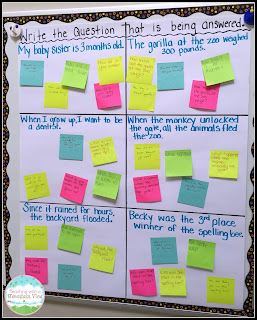 It was fun to read some of the questions the kids came up with because they were all different. We went through and talked about what made it a "bad" answer. Then, I gave them the actual questions that were being answered, and they loved it! Question 1: Why didn't you eat your bacon for breakfast? Question 2: Why did mom burn the cupcakes? Question 3: What time does the stadium open for the game? Question 4: Why are you still sitting on the dock? Question 5: Why did the family move to California? Question 6: Why didn't Jack use his blankets? Then, I gave them the same task, but with excellent answers! (Side note-- you can really do this activity in any order. There are merits to both ways.) Almost every question they wrote was identical, because the questions HAD been restated in the answer. They completely understood WHY it was important to restate the question! The next day, I had them do the same task with a partner to reinforce the idea. They each got two GREAT answers and two terrible answers. They wrote the questions, and then I gave them the sheets with the actual questions and they could compare what they wrote to what the actual question was. You can download these sheets for free HERE. Finally, I had the students work through some scaffolded task cards to start applying the skill to reading passages. The cards on the left (pink) have the key words in the question underlined AND the answer underlined in the passage. 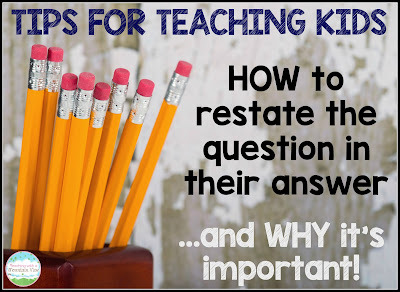 They don't have to think too hard about the answer, but they can focus on writing the answer correctly. I had them do 8 of these. Then, I had them do 8 of the blue cards, which don't give them any clues. 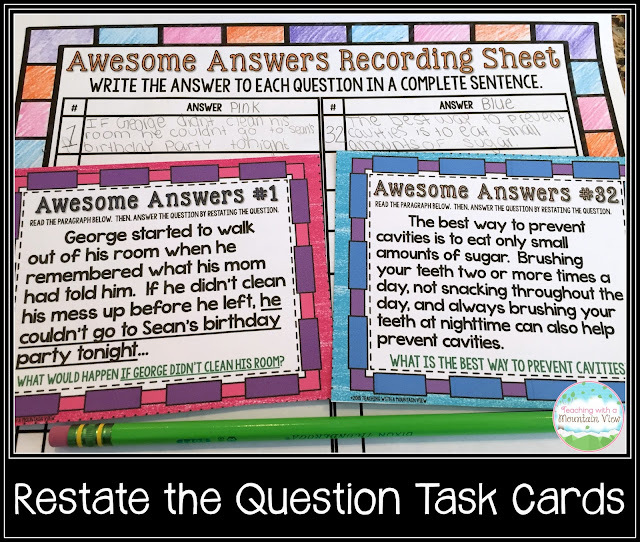 You can find these task cards at my TpT store HERE. After this task, it was time to start applying it to their literature-- the whole point of learning the concept. They all had a solid understanding of how (and WHY) to put the question in the answer. I hope your students do, too! I've always struggled with teaching this, and seeing the way you do it has really helped a lot! Thank you so much for the great ideas! I love this lesson! Will use this. Thanks for sharing. Love this! 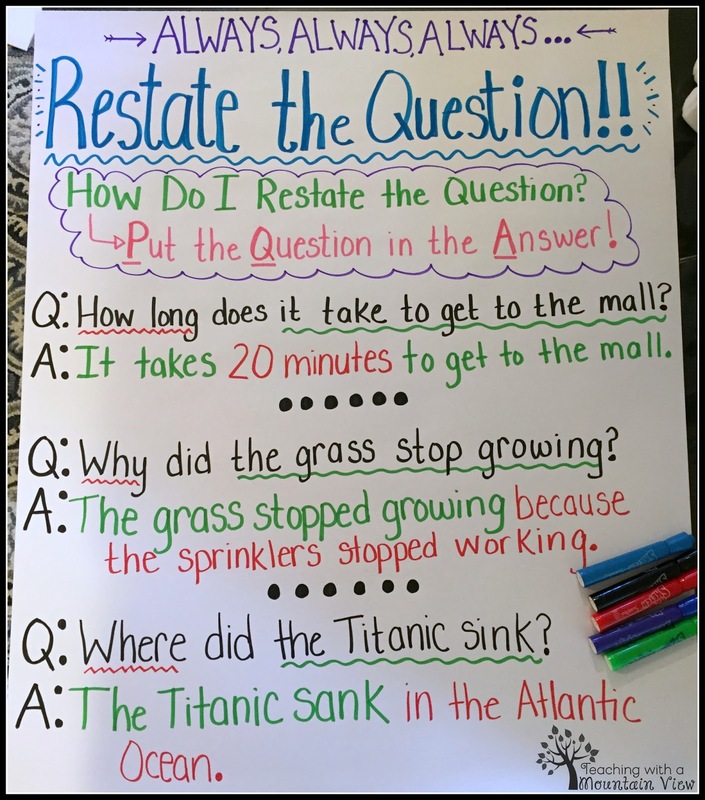 Do you have lessons that you do for the rest of constructing a response ? When I tried clicking on HERE, I only got a blank page. Is the link gone or....? 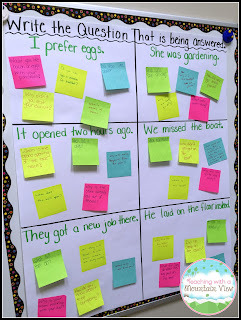 I love your things and use many of them in my 4th grade classroom. I am going to start the year with this activity. I have tried several different ways to teach this, but yours makes the most sense. Thanks for all your creativity! It's like pulling teeth to get kiddos to do this. Thank you for the practice sheets! They will definitely come in handy to put in their reading INBs. I'm wondering what grade you would teach this in? I'm a new teacher of first grade and wonder if they could handle this. I love it! I can't even begin to describe how awesome and perfect this is for the first few weeks of school! This is going in my lesson plans. Thank you for yet another outstanding resource that is so easy to follow and involve the students. 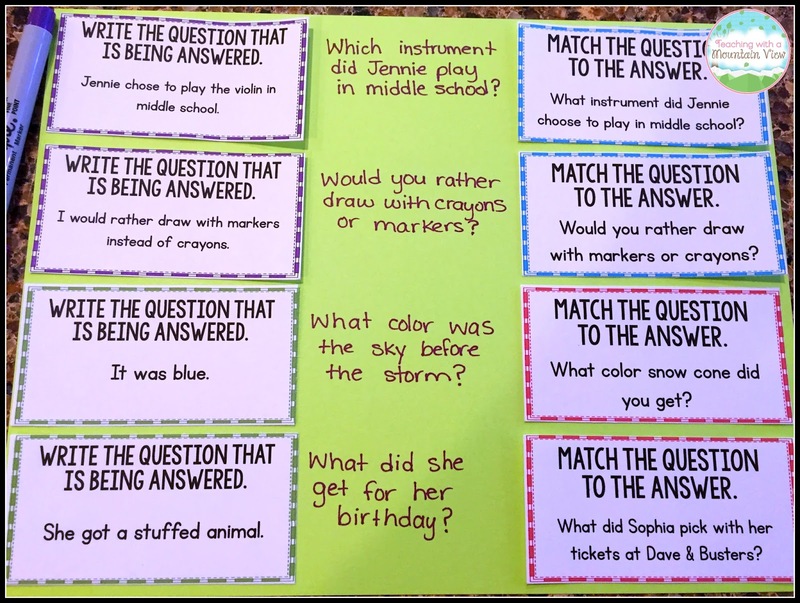 You are right, no matter what we think, they always need to review this and the beginning of the year is a good time for this fun activity! 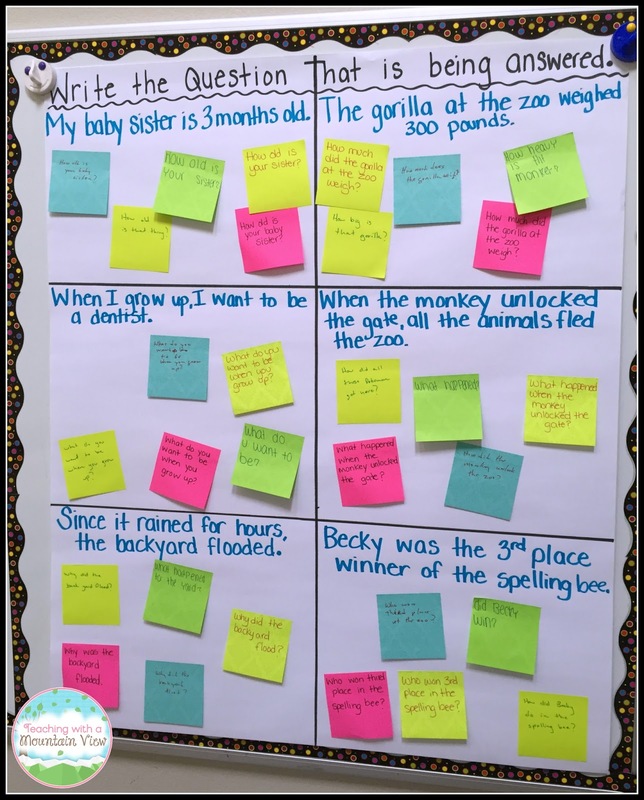 I always teach this skill at the beginning of the year, but these ideas are perfect! I just bought your task card set for Awesome Answers and I can't wait to put them into action with my third graders! Thank you for such a fantastic lesson idea!